DELICIOUS & GLUTEN FREE: Pure Protein Bars feature the combination of high quality protein and great taste. This delicious, gluten free, chewy chocolate chip bar has 20 grams of protein to help fuel your super busy day. ON-THE-GO PROTEIN: Pure Protein Protein Bars provide high-quality protein essential to a nutritious balanced diet and important for supporting lean muscle and an active lifestyle. Pure Protein bars are a convenient, on-the-go, pre- or post-workout snack. 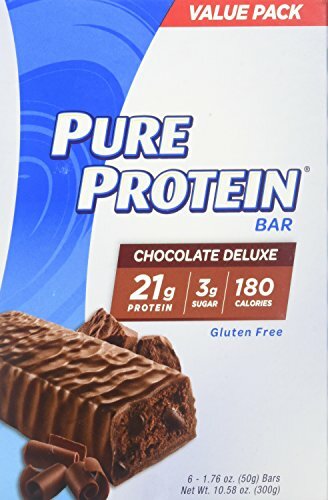 COMPARE PURE PROTEIN bars and shakes to: Gatorade, Dymatize, Syntha-6, Quest, Clif Builder's Protein, thinkThin, RXBAR, Zone Perfect, ISS, Optimum Nutrition, PowerBar, Premier Protein, One Protein, MusclePharm, Luna, FitJoy, MuscleTech, or Power Crunch. Final Price as low as $10.18 Shipped!